I am a true crime junkie. Ann Rule is one of my favorite non-fiction authors: I have read everything she’s published – and re-read it. l love that her histories are moral tales and that the perpetrator is always caught and punished. She delves deeply into the motivations behind the crime and is especially compassionate to its victims. Not all of my crime writer friends enjoy reading true crime. For many, murder must stay in the realm of make-believe and real life is more akin to horror. Other friends draw on true crime to make their work more believable. So why does true crime fascinate me? Early in my career at the Ontario Ministry of Health, I was assigned to the team investigating a series of mysterious deaths at Toronto’s Hospital for Sick Children. This scientific study ran parallel to the ongoing police investigation. Because Ontario didn’t have the necessary expertise and resources, the Ministry engaged the Centers for Disease Control, Atlanta who led the team. In the end, the scientific study agreed with the police investigation: the hospital deaths were due to homicide. Unfortunately, the murderer was never caught and punished. The study changed the lives of everyone who worked on it. The Ministry made epidemiology and disease investigation a priority, which greatly helped to protect the public during the notorious SARS outbreak. My boss, Rick, left public health to become a forensic psychiatrist. And I developed a life-long compulsion to uncover the “why” behind crime and eventually took up crime fiction writing. This rainy holiday weekend I visited Fincher’s, our beloved bookstore in cottage country, which has an interesting True Crime section. The Charming Predator caught my eye. From the first page, I was hooked: this book reads like a thriller. Lee Mackenzie worked for 21 years as a broadcast journalist and news anchor. While backpacking around Wales as a young girl trying to find herself, she met the charming Kenner Jones at a local tourist office. They struck up a friendship that blossomed into romance and marriage. Kenner had a way with words. Like many conmen, he possessed remarkable verbal skills and bamboozled dozens of people out of their life savings, including Lee while they were married. Lee chides herself throughout the book for her innocence and lack of self-esteem which led her to ignore her misgivings and to overlook Kenner’s many lies and outrageous fabrications. Eventually she broke free of him. How? You must read her book to find out! 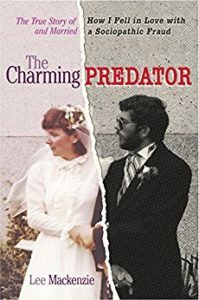 The Charming Predator is a warning to those of us who grew up protected and were taught to believe the best of people. After reading this book you will be especially wary of pious people who hang around politicians. And so arm yourselves, readers and eat this book! Next Next post: HAPPY BIRTHDAY CANADA – How Small Towns Celebrate!